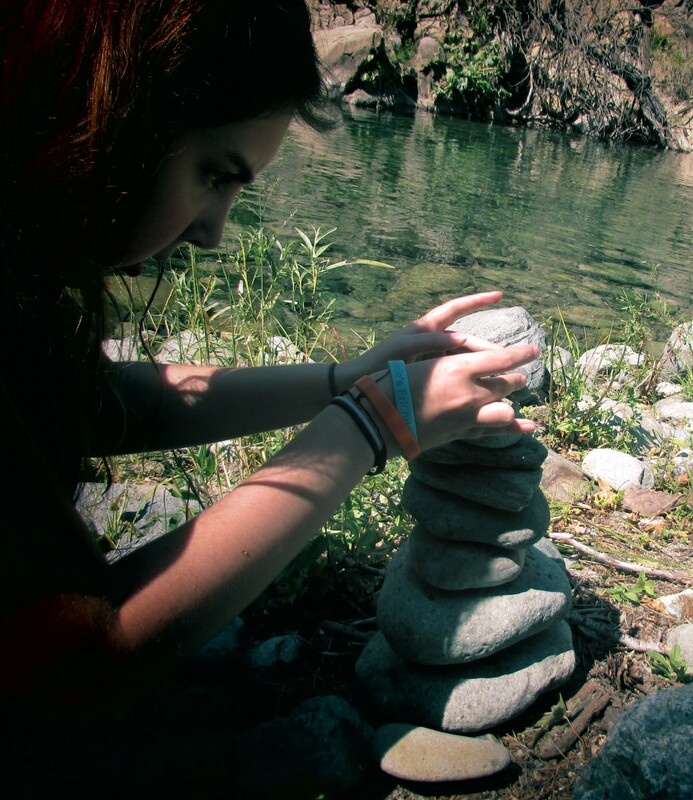 We just got back from a long weekend in Downieville. It is finally starting to come together! Remember we bought this little bungalow on the river last November? (Read more here.) Built some time prior to 1930, it needed a lot of TLC. My husband quickly started to work on the bedroom and bathroom as they were in the worst shape. 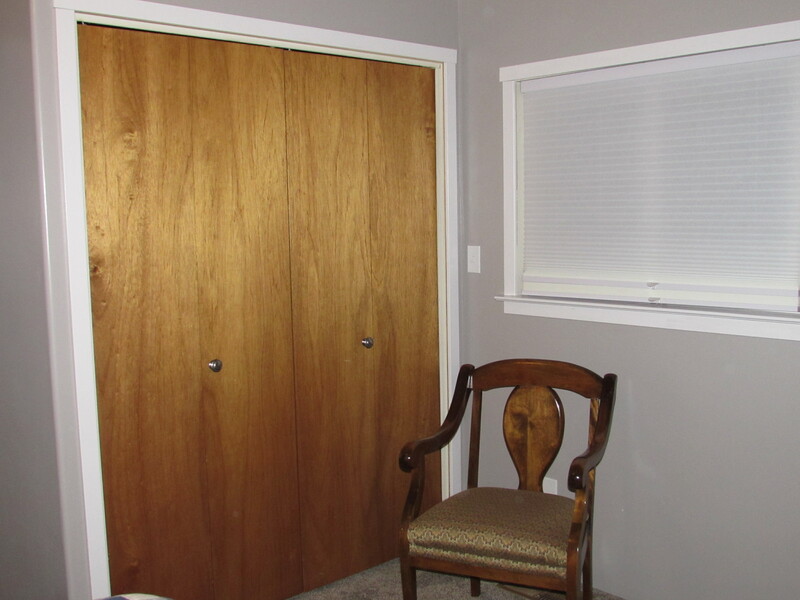 This weekend was spent painting many pieces of crown moulding and trim pieces for the bedroom door, closet and window. (That was my job.) Ray was installing it as quickly as I could paint it and get them dry. Drying actually took very little time as it is really hot this week. What a huge difference Ray has made in the house so far. He has transformed it. 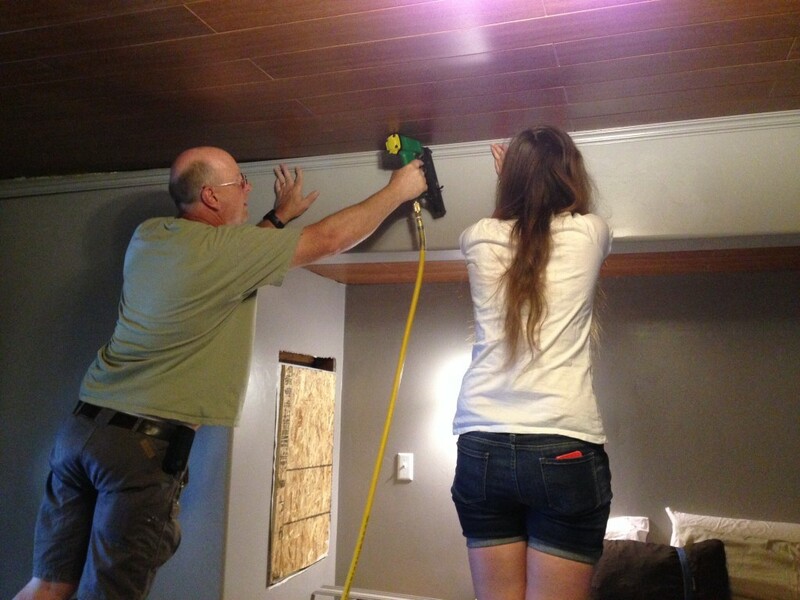 Ray had a helper when he installed the crown mouldings. You can see there are two more windows to replace (on either side of the alcove.) Ray hasn’t decided exactly what he wants to do there so that project is on the back burner for now. Here is another corner of the room (the closet.) 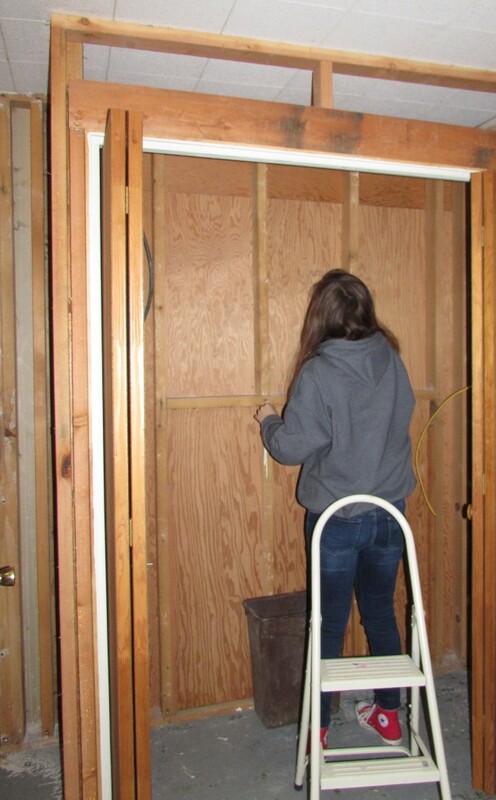 This picture was taken last February when Julia was pulling nails from the studs for Ray. Here it is now! Nice work Ray. Gorgeous, isn’t it? New drywall with actual insulation in the walls (prior to now the house only had minimal insulation in the attic.) Does it get better than that? Oh yeah. New window, paint, trim and carpet. After countless weekends, it is a bedroom! Did you see that cute chair in the picture above? Ray and I found that chair at a thrift store that supports Habitat for Humanity. 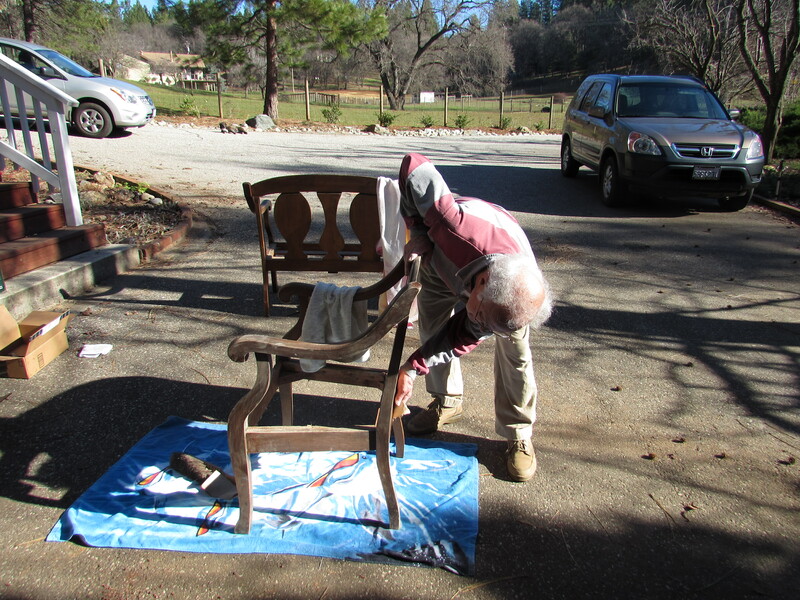 My dad and I spent a fun morning together taking it apart, sanding the wood and staining it. Can you see that the seat is covered with plastic? Lovely! There were approximately 567 billion staples holding that fabric to the seat. Yikes! We got it 80% done and then the chair sat in the garage for several months. I am sure you know how that goes. 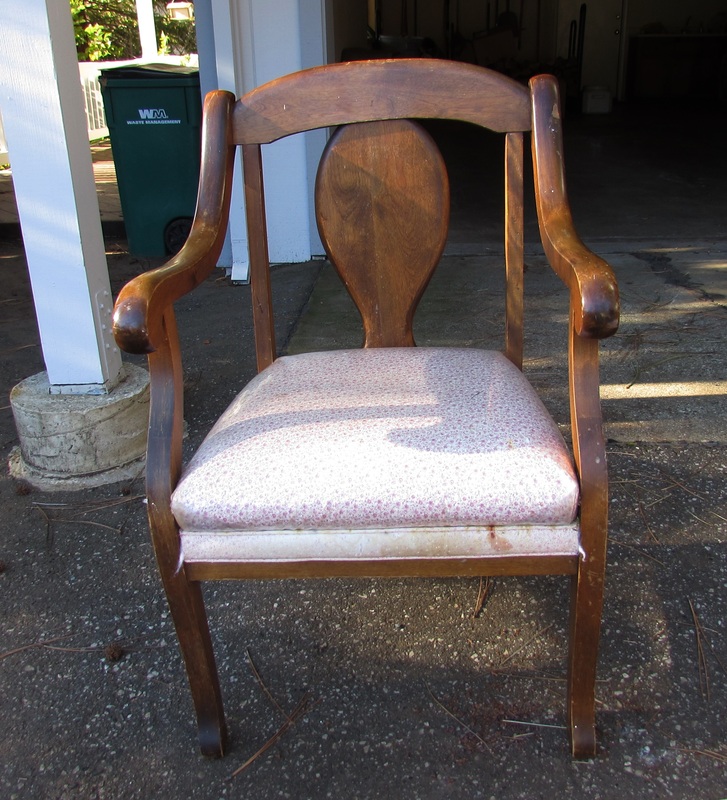 Ray and I finally found some time, weeks down the road, to put some polyurethane on it and reupholster it. Much as I loved that pale pink floral fabric covered with plastic, I like this better! It looks so cute in the house as it fits the style perfectly. It is comfortable for reading but I do want to put a foot stool with it. I saved some of the fabric so that I can make a matching one someday. Now that the home is coming along, we don’t have the pressure to work long hours on it when we are up in Downieville. The pace is more reasonable which allows for some time to play. 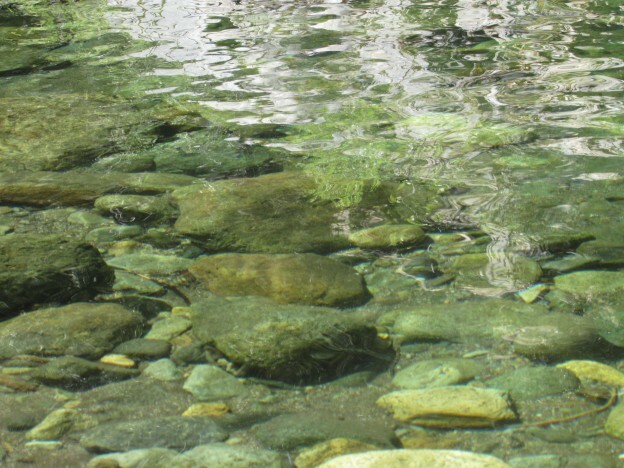 Over the weekend we had a great time on the northfork of the Yuba river. 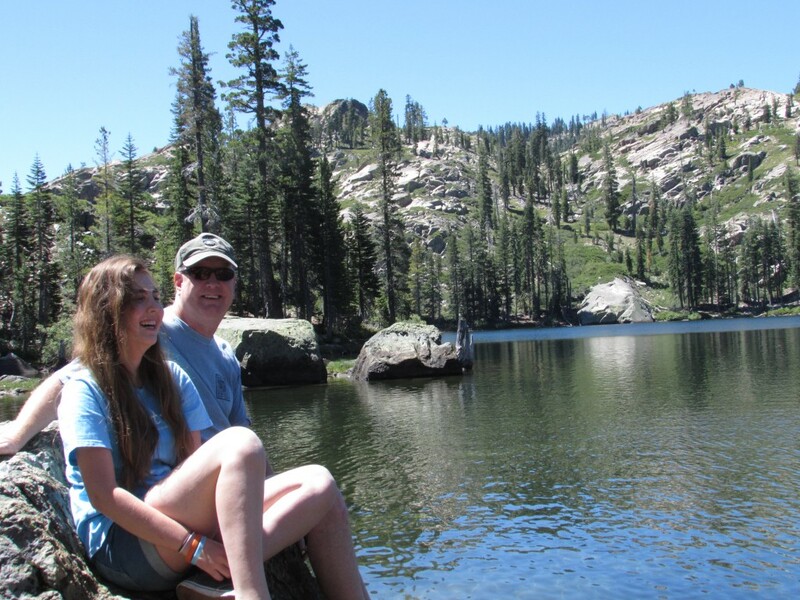 We also took some time to hike around a bit at Sardine Lake which is about 15 miles up the road from the house. It is gorgeous. Next time we will spend the day there and play on the lake. While we were up in Downieville, a large forest fire started right on the edge of Nevada City (maybe 15 miles from my house and probably less than 5 miles from my parents’ house.) It is a bad one – not to be unexpected with the dry, hot, drought conditions we are dealing with. The fire is about 60% contained and is burning some 2,300 acres. Currently there are 1,952 firefighter personnel working the fire. It is amazingly complex to control and battle fires of this size. The smoke is in the air but it is lessening each day. I am so grateful for the teams that are working diligently to contain this fire. Because this fire is consuming rural properties, many animals had to be evacuated and there are teams of volunteers taking care of them at the county fairgrounds. This is a great community. Yesterday a popular, local burger place fed firefighters for free during the day. That is a big undertaking as there are lots of hungry firefighters in town right now. In case you are worried about my lack of stitching this week, fear not. I did bring up assorted fabrics and Insul Bright to cut and prep a stack of Chemex Cozies. I will be ready for a sewing marathon next week creating more Etsy product. I do love when I have projects all cut and pinned. Enjoy these last weeks of summer everyone! We are headed to the coast for a long weekend with family to celebrate my in-laws 50th wedding anniversary. It will be a great escape from the triple digit heat and the smokey air! 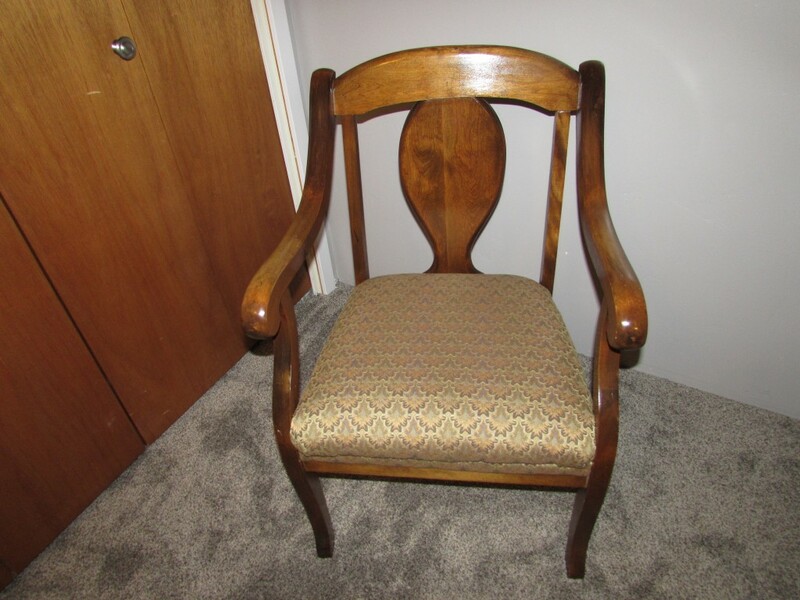 This entry was posted in Downieville house, Family and tagged chair refinishing, downieville, yuba river on July 30, 2015 by Bernie. Giveaways are pretty darn fun. Luck has been on my side and I have two wins to brag about. I know it isn’t nice to be boastful but what can you do? Plus I want to show my thanks to the bloggers that sponsored these giveaways. The first win was actually in late spring which means I am a bit late in writing about this one. I entered a giveaway on Linda Smith’s blog, Scrapmaster. She and several others were writing posts to introduce their guild, the Maritime Modern Quilt Guild. I was lucky enough to win the draw for three lovely fat quarters! Thanks so much to Linda. 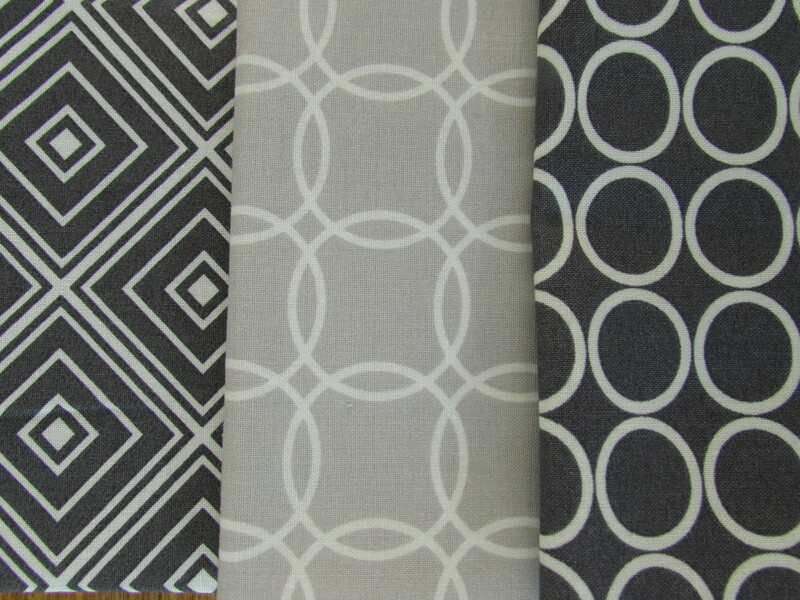 The dark and light grays in these prints are so pretty and they will be fun to incorporate into an as of yet unknown project. The other prize I won was from the June giveaway for A Lovely Year of Finishes (ALYOF) which I have been faithfully linking to each month since January. (If you aren’t already familiar with it, ALYOF is a fun link up. 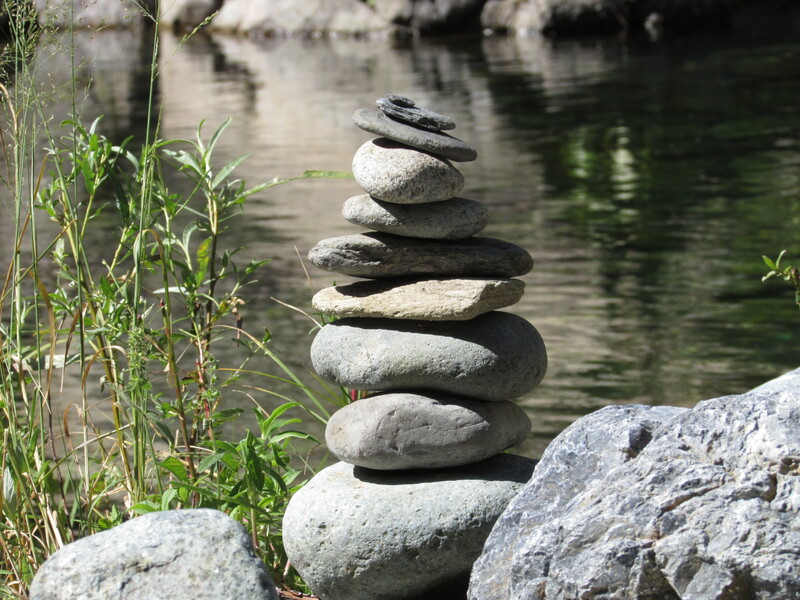 At the beginning of each month you link one quilty goal that you have for that month. If you finish the goal, link again at the end of the month. They have a number of prizes that they draw names for each month.) When I won, Kim Lapacek, of Persimon Dreams, gave me the pattern of my choice. It wasn’t easy. She has a selection of really fun patterns that she has designed. 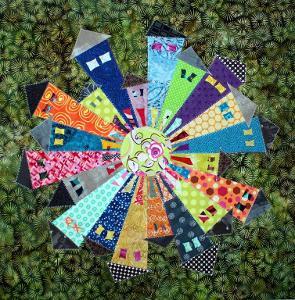 Being a lover of dresdens (here is a post a bout the first, and so far only, dresden project) I chose her pattern titled, Dresden Neighborhood Block. 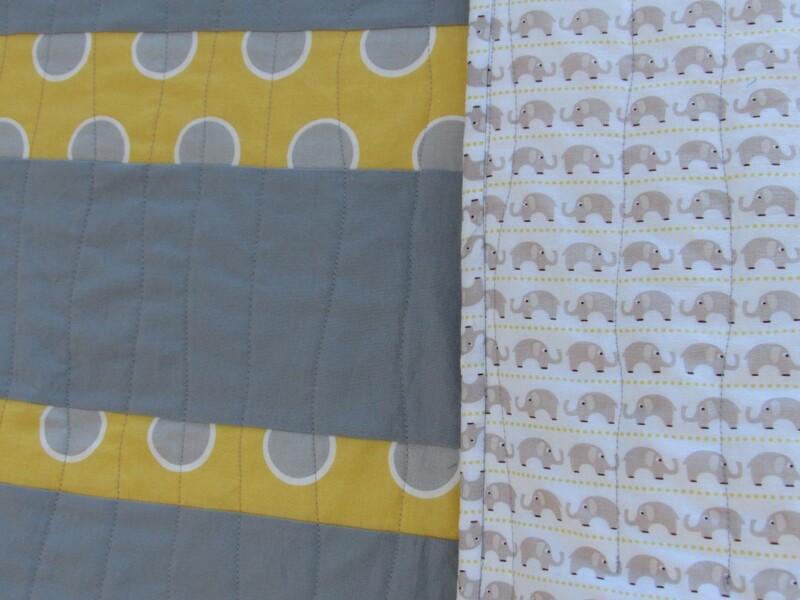 This pattern is such a cute riff on a neighborhood. I plan to make a mini with it. If you want a closer look, the pattern is available here on Craftsy. 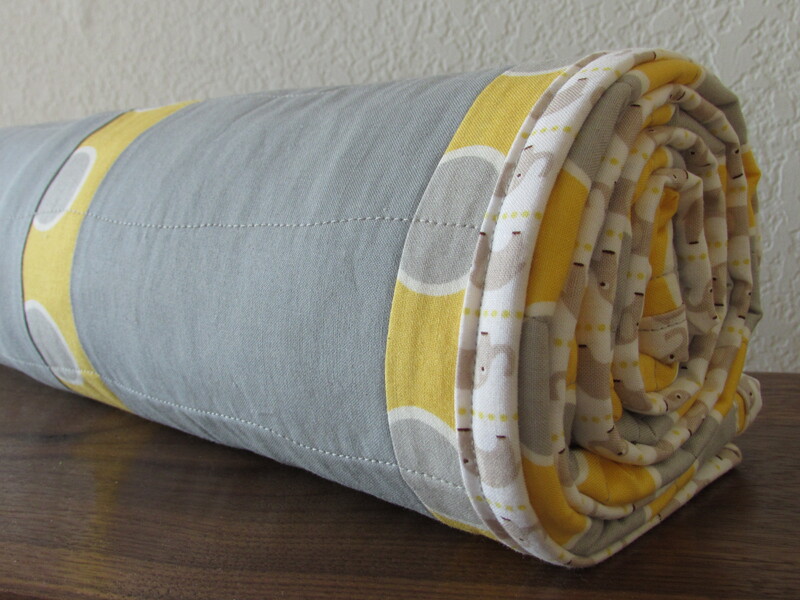 Thanks so much to these two blogger/quilters for their generosity! I do love this community of ours. I have been squeezing in minimal time for sewing over the past few days. 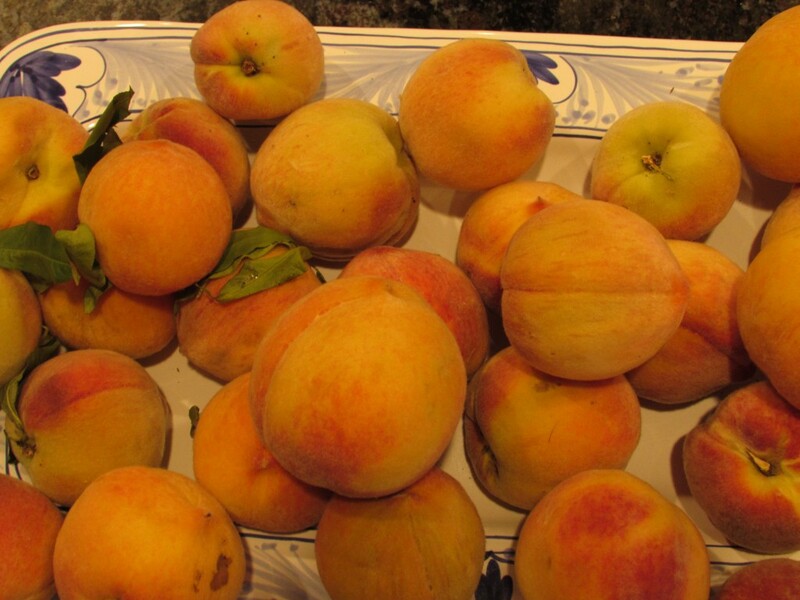 Instead of my sewing room, I have been in the kitchen dealing with the amazing number of peaches ripening on our tree. They are so juicy and sweet but really, we have more than we can handle. 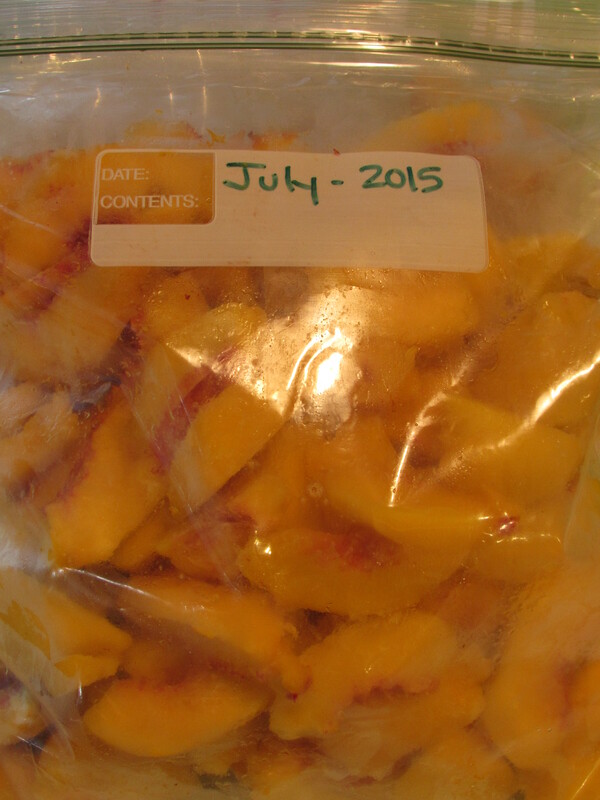 So far, I have frozen five gallon size zip lok bags of sliced, peeled peaches for making pies over the winter. 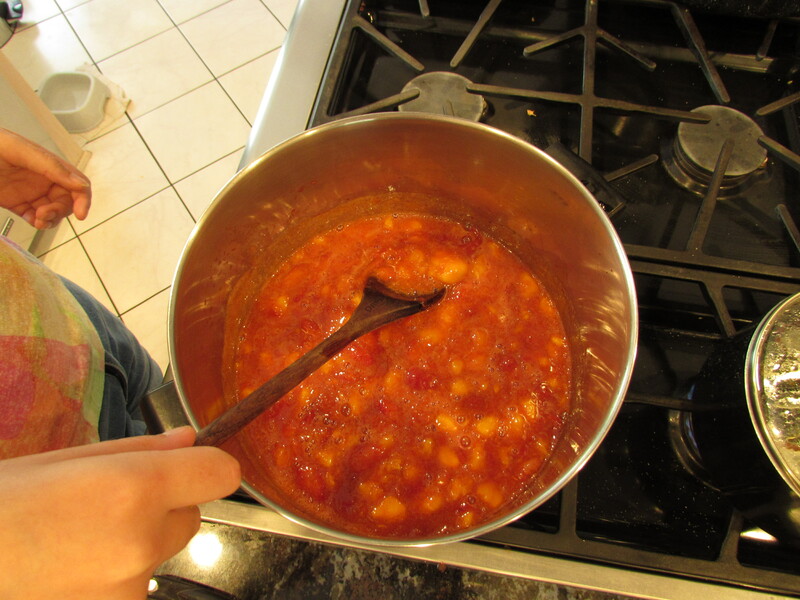 This morning Julia and I made a batch of jam using strawberries and peaches. We canned 8 half pint jars and will do at least one more batch. I think peach jam on its own can be a bit bland so I like to add berries to it. Last year I did raspberry peach and it was really good. I am a bit worried that this batch isn’t going to set up properly. It doesn’t seem to be getting thick enough as it cools. 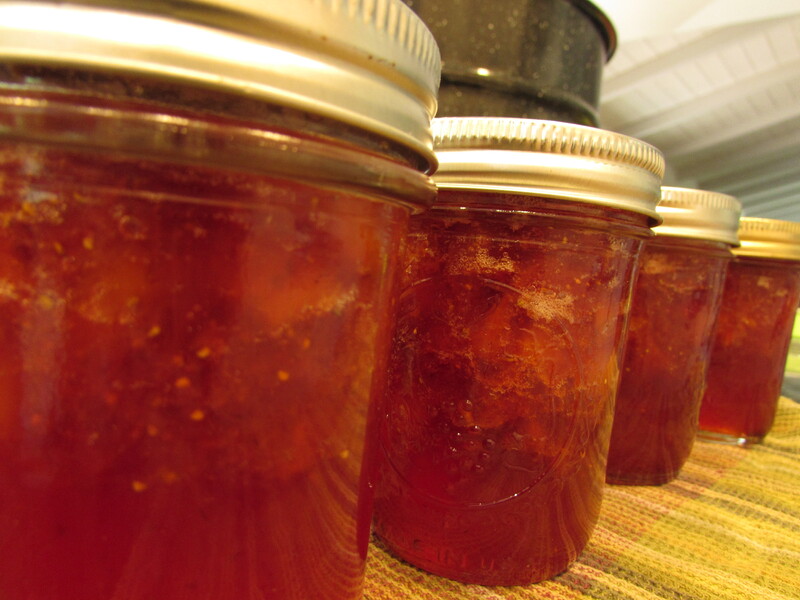 True confession time – my husband is really the jam maker in the family. He does a great job and just uses fruit and sugar, cooking it down until the consistency is perfect. Me, not so much… Last year I tried his method and ended up with a product similar to Jolly Rancher hard candy. I tossed the whole batch. I just cannot get a consistently reliable result. Today I used pectin and followed a recipe (which for some reason, Ray never needs to do) and I am just not confident it worked. We shall see. If this batch turns out to be too soft, I will just have to resign as assistant jam maker and leave it to the expert. Summer is going so fast. Today Julia received an email from the high school with an assignment to read two books before school starts on August 18th. And so it begins! Hope you are all enjoying your summers and savoring the days. Linking to Freemotion by the River. This entry was posted in Art Quilts, Giveaway, Gratitude and tagged ALYOF, giveaways, jam making on July 20, 2015 by Bernie. Hey everyone! I finished the vintage double nine patch quilt top. Yay for staying with it and getting it done. It is a good size for a lap quilt. Finished, it should measure out to about 60″ x 70″. I am really happy with it and look forward to getting it basted and ready to quilt. The quilting decision is an important one due to all of the negative space that this quilt has. 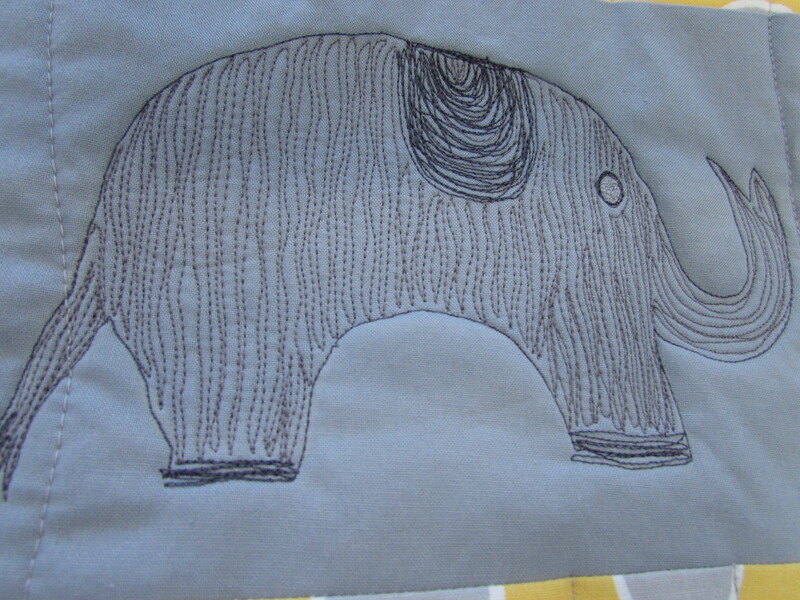 My FMQ skills are improving but aren’t stellar. What to do?? 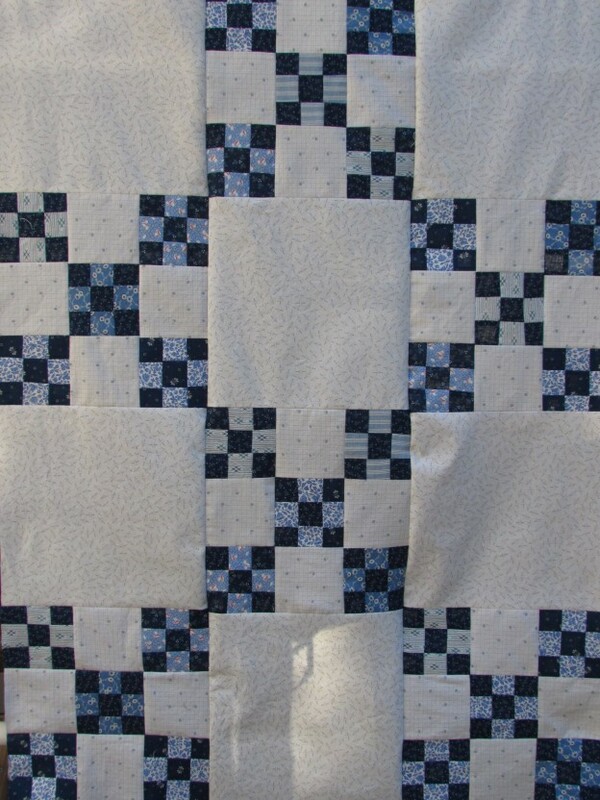 My thinking is that this sort of traditional quilt calls for FMQ over straight line quilting (I usually associate straight line quilting with a more modern project). Because this will be auctioned off at a 1940’s themed fundraiser in October, I feel like I need to do some decent quilting on it. I need a foolproof idea! Please help me out here and send ideas my way! Do I do an easy all over stipple? If so, do I stipple the main portion and do something different on the borders or just cruise right over the borders too? I have plenty of time to decide. I don’t have any batting just now (well, other than the piles and piles of batting scrap – I could probably stitch those scraps together and make a piece large enough for a king size quilt). I need to spend some time on Pinterest and hop over to a few sites (The Inbox Jaunt and The Freemotion Quilting Project come to mind) for inspiration. One more thing…. Totally off topic here, but yesterday my quilt model and I went to the movies and saw “Inside Out”. I had high expectations for this new Pixar film since the reviews are glowing. Yikes, I was disappointed. Both of us kind of shook our head on the way out, wondering what the hype is all about. I found it really preachy – sort of like they were forcing a lesson down my throat. Neither my daughter nor I could figure out what age group this was aimed at. The plot doesn’t seem suitable for early elementary school ages and it seemed very trite for older kiddos. Did I miss something? Maybe I wasn’t in the mood for it? Just curious what others are thinking about this movie. 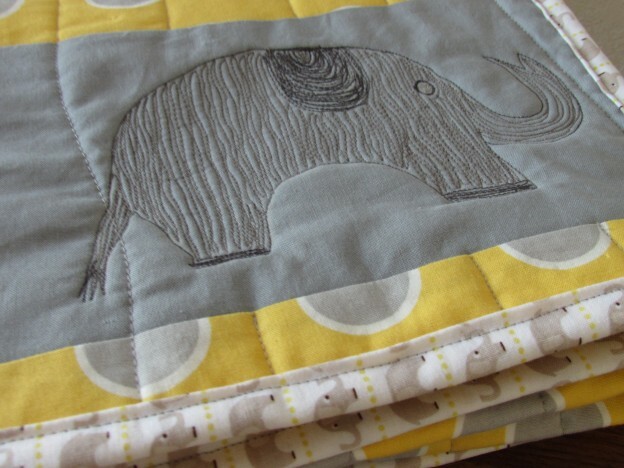 Linking up with Crazy Mom Quilts and Needle and Thread Thursday. Links to these sites are available at the top of the page, under link ups. 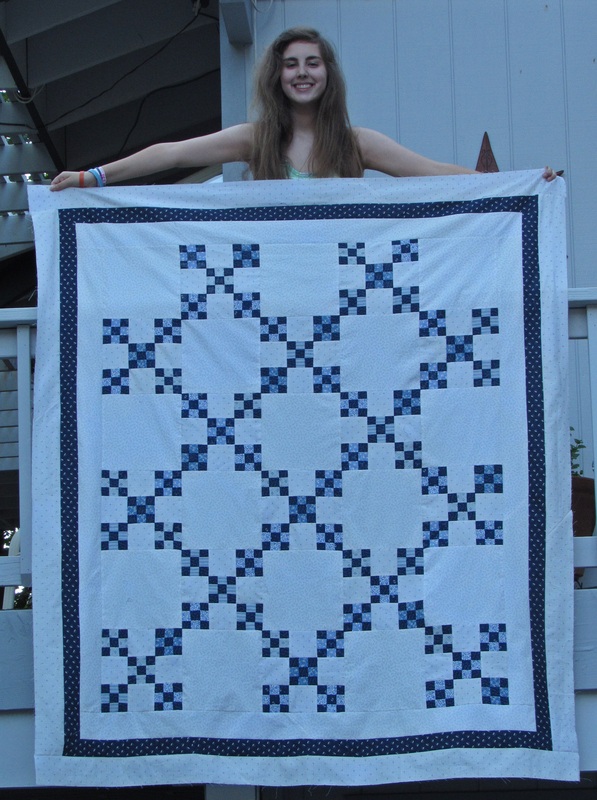 This entry was posted in ALYOF, Family, Lap Quilts, Pieced Quilts, Scrappy Quilting, Vintage and tagged double nine patch, inside out movie, vintage fabric on July 16, 2015 by Bernie. 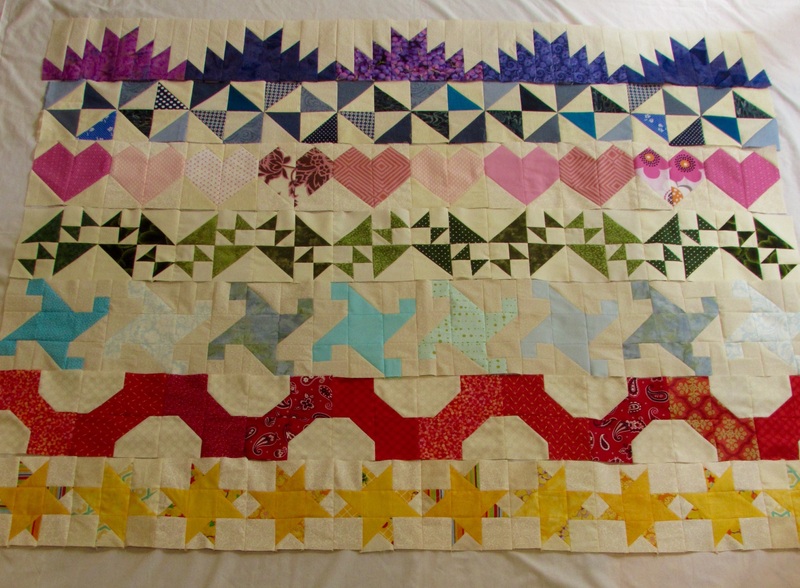 Well, I am happy to say It have made great progress on my vintage double nine patch quilt. I have all of the blocks done and have been sewing the rows together. It worried me to set this as my goal for June but it appears I’ll be able to finish it this week and we are only at the middle of July! Just never know. Here are a few rows – they are not yet pressed though. This quilt has been fairly mindless to create. Lots of repetition in making the smaller nine patches and then sewing those into the 9″ blocks. For the most part I have been happily listening to music and stitching away. 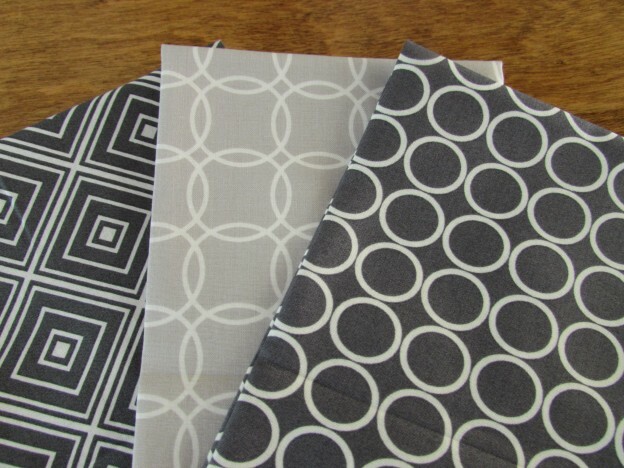 I usually have either music or a podcast on when I am sewing, unless I really have to focus on the pattern. This week I indulged in lots of oldies. I had my playlist set to include music from the early 1970’s (which would have been junior high and high school for me). Carole King, Van Morrison, Cat Stevens and The Lovin Spoonfuls, to name just a few. Music doesn’t seem to distract me when I am sewing but TV is not such a great idea. When I was cutting the smaller background squares for this quilt there was an episode of “The Office” playing. (Julia recently discovered this show.) It was so distracting – I think that show is so funny. I ended up cutting 3″ squares instead of 3 1/2″ squares. Dang it. I have tons of the fabric so that wasn’t a problem but now I have a pile of 3″ squares ready for another project and I had to spend the time to cut a new stack in the correct size. Clearly watching tv doesn’t work for me when I am sewing or cutting. The quilt will have two borders of the cream fabric with a narrow border of navy blue in between them. 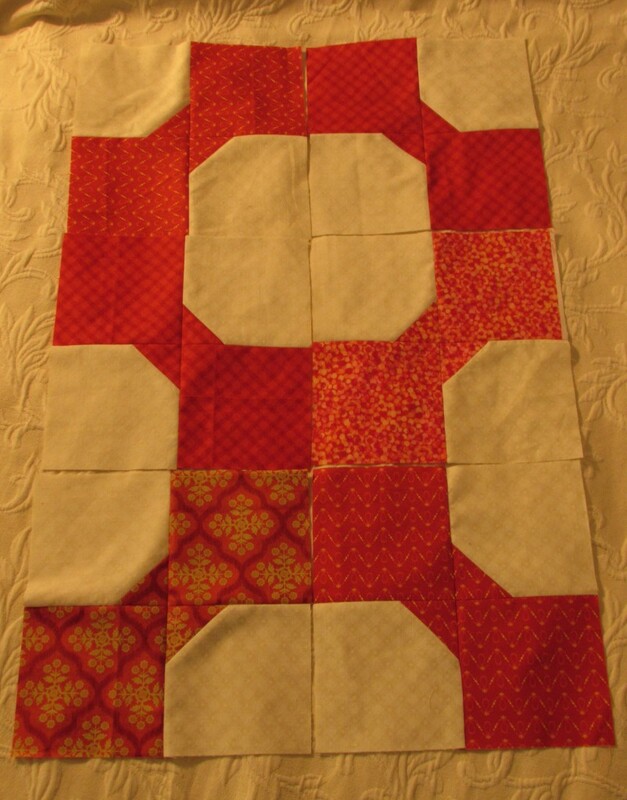 If you remember, the small nine patch blocks are made with the vintage fabric that I received last spring. I need to look through the vintage stash to see if I have a big enough piece to make the navy border. I think I need about 1/2 yard and doubt I have a piece that big, especially since the vintage fabrics are 24-36″ wide. Looks like a trip to my LQS is on the agenda for tomorrow, darn it. I am really excited to sew the rows together and put the borders on. Hoping to have a quilt top finish for you by end of the week. So, what’s on your playlist when you are sewing??? Do tell. Linking to Lorna at Let’s Bee Social and Connie at Freemotion by the River. Links to both of these parties are at the top of the page, under Link Ups. 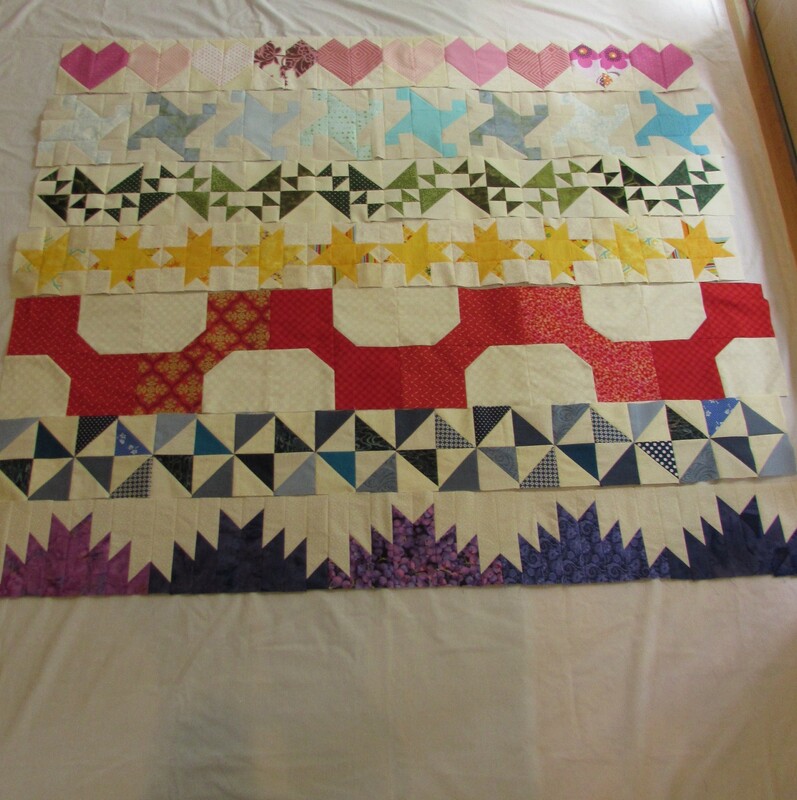 This entry was posted in ALYOF, Pieced Quilts, Scrappy Quilting, Vintage and tagged ALYOF, double nine patch, vintage fabric on July 15, 2015 by Bernie. Here is an update to yesterday’s post! Because the size of those red blocks was driving me crazy, I decided to fix them. It was simple and well worth the bit of time it took. Being made of simple squares, I just cut them down. I didn’t even rip the original blocks apart. They were so much bigger than necessary that I just sliced them apart. First I cut them to 7 1/2″ blocks but they still looked too big. I cut them back to 6 1/2″ and they are just fine. I had to make a few more blocks to complete the row. I don’t know yet in what order I will put them together. They need sashing though. With each row made of a different block, the patterns don’t line up. I think they need separation between the rows. I also have some definite issues with a few rows being short or long. That will have to be dealt with before I can assemble this. I don’t look forward to that….. If anyone has a strong desire to do a random act of kindness, please come and fix them for me. Very glad to be able to call this a finish for the month of July on my RSC15 project! Linking to Crazy Mom Quilts. 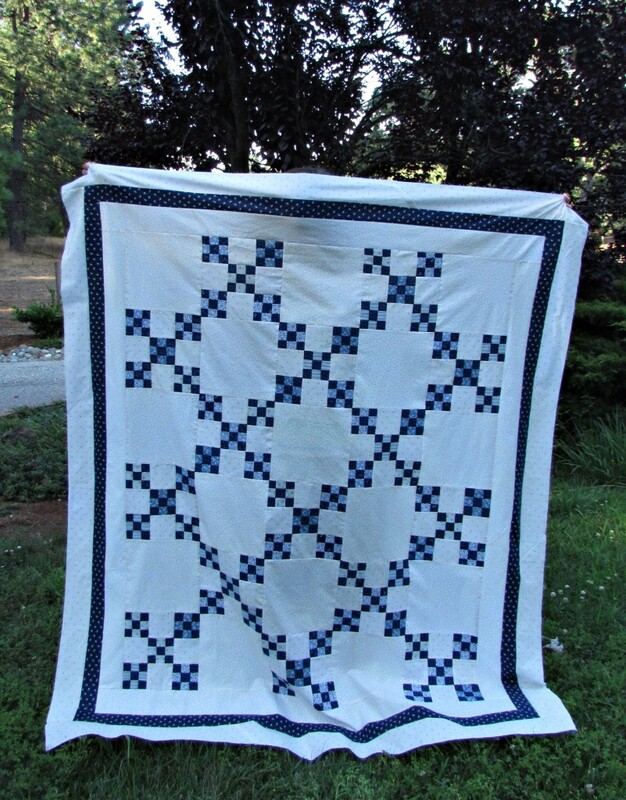 This entry was posted in Pieced Quilts, Row Quilt, RSC Challenge, Scrappy Quilting and tagged bow tie block, Classic Stitches BOM, RSC15 on July 9, 2015 by Bernie. While I am making good progress on the vintage double nine patch blocks this week, I got a bit bored with them this afternoon. I decided to take a bit of a break today and I worked on my July row for my RSC15 project. I mentioned earlier that the block that Mari decided on for the month of July was a bit labor intensive. Because of this, I opted out of the Classic Stitches BOM just for this month. I will go back for the August row. Instead, I chose to make a row of simple bow tie blocks. Red is the color for July for RSC15 and that is a fine color for a bow tie. This will be my power tie row. 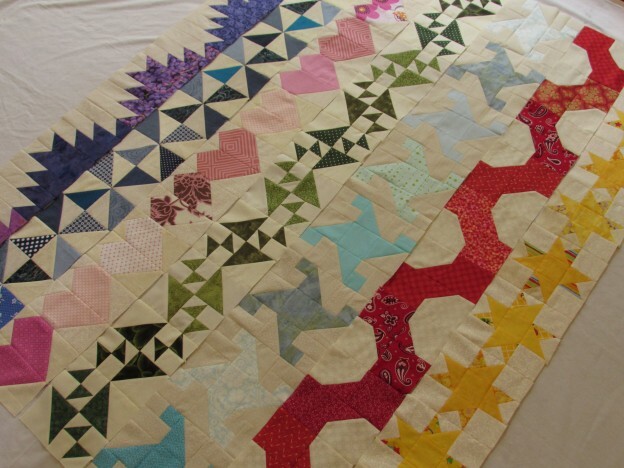 I love the blocks and think they would make a great quilt all on their own. Excuse the weird colors on the picture below. I took this in my sewing room so it the lighting was sub-par. I wanted to add some bigger rows to the quilt. So far I have five rows that are made of six inch blocks, one row with 7 & 1/2″ blocks and this month I made 10″ blocks. To avoid doing the math needed to create 10″ blocks, I used the Block Fab HD app on my iPad that I have mentioned previously. While I like this row on its own, I am not so sure I like it with the other rows that I have made. When I lay out the rows together, this row is so huge and chunky. I may just leave it for now and see what the block is for August. If I make another row or two of ten inch blocks, it might balance out. If not, I can easily make a new row of bow tie blocks. They go together quickly. The more I look at this picture, the less I like the huge row of red. If I just shrink them down to 7 1/2″ blocks – that might give it the balance it needs. Then the bow tie blocks would be the same size as the light blue water wheel row and would be different from all of the six inch rows. Do I call this a finish for RSC15 for this month? I doubt it. Me thinks I will be making more red bow ties. 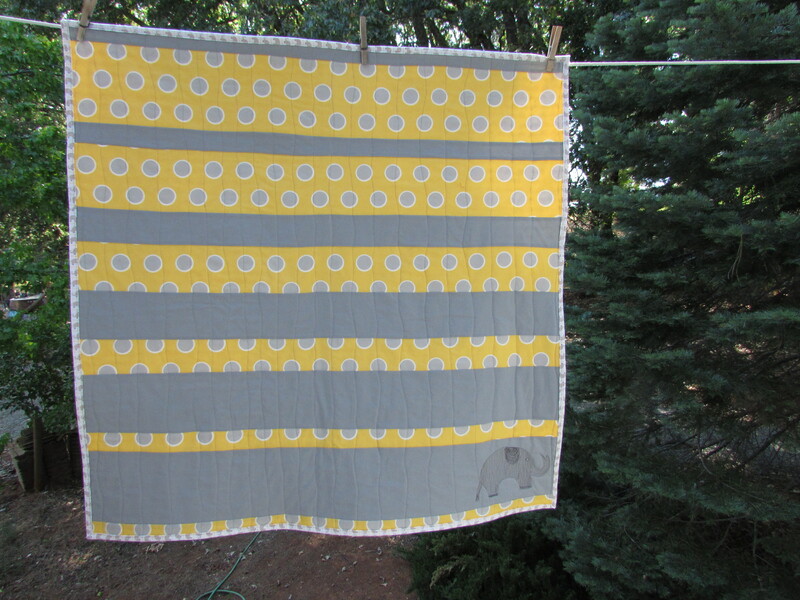 linking to Let’s Bee Social, So Scrappy and Crazy Mom Quilts. 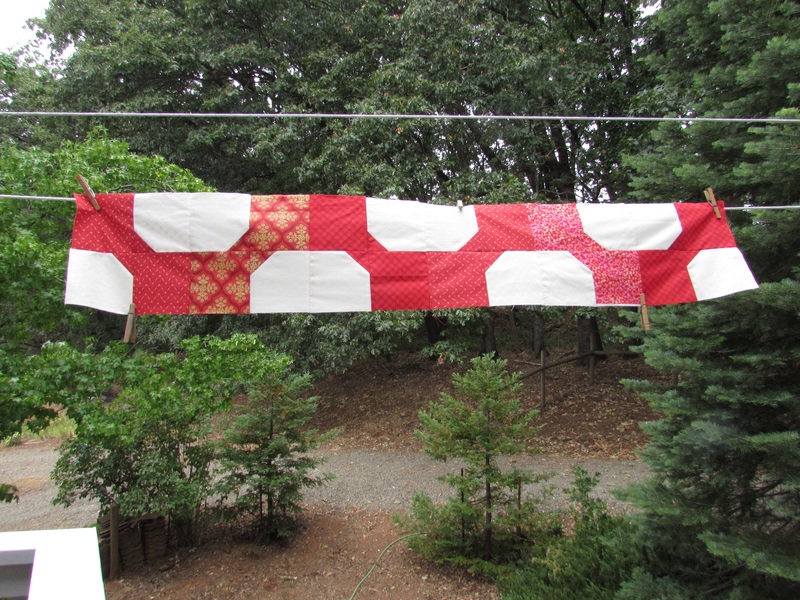 This entry was posted in Pieced Quilts, Row Quilt, RSC Challenge, Scrappy Quilting and tagged blockfab-hd, bow tie block, Classic Stitches BOM, RSC15 on July 8, 2015 by Bernie. This morning was, as it has been all week, too hot to work outside. My husband and I were cleaning up our basement (it stays nice and cool down there!) As we went along, I made a huge pile of items to donate at one of our local thrift shops. I came across a bag of odds and ends and thought it best to take a quick look before adding it to the pile. I’m so glad I did! In the bag was a pile of fabric that I had purchased some time ago at a garage sale. It was the sort of thing where you buy an entire bag without being able to take it apart to see what is really contained in the bag. I threw caution to the wind and spent my $3.00 on the mystery bag because that’s the kind of person I am. Most of the fabric was not my type of thing (lots of shimmer and shine.) So it ended up in the basement. This morning I took a closer look before donating it and found a set of African wax print fabrics! Score. I hand washed them as I was fairly certain the bright colors would run a bit (and they did.) They looked so pretty hanging on my line in the way too hot sun. They dried in about five minutes! 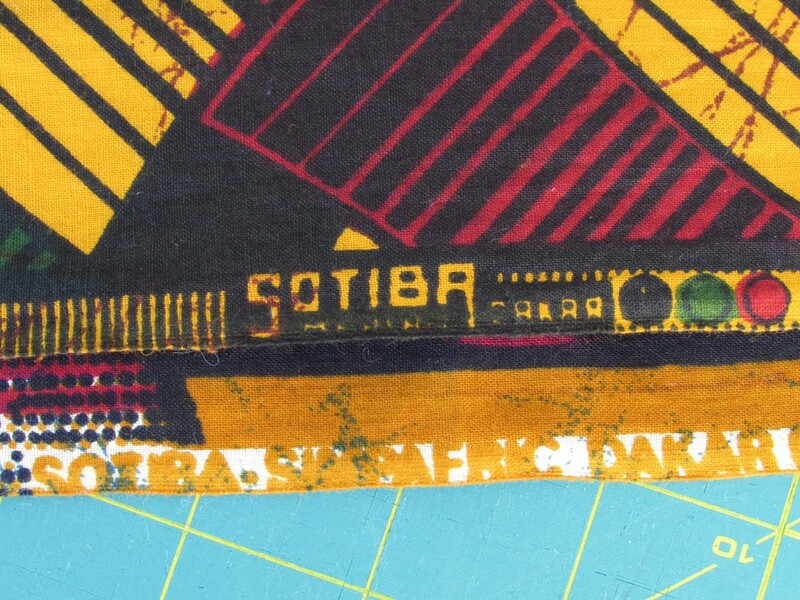 Two of the four pieces are marked as being Sotiba prints, made in Dakar, Senegal. There are conflicting accounts of the status of Sotiba. When I was googling the company there was reference to it going out of business in the late 1980’s and also some reference to current production. I honestly don’t know if they are still making fabric. Anyone out there have any info on this?? The pieces aren’t large – they measure about 14″ x 25″. Not quite a fat quarter in size. The colors are so bold. 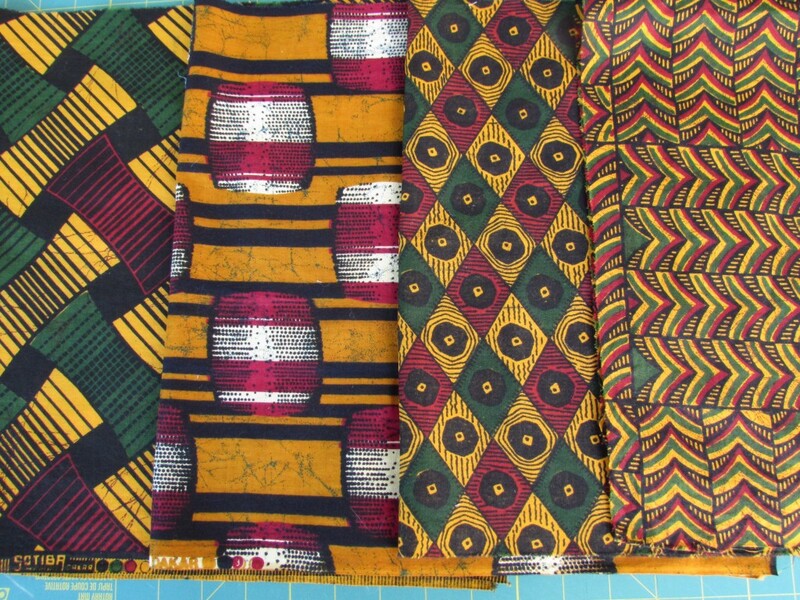 I was first introduced to African wax prints last November when a customer requested a custom order through my Etsy shop. 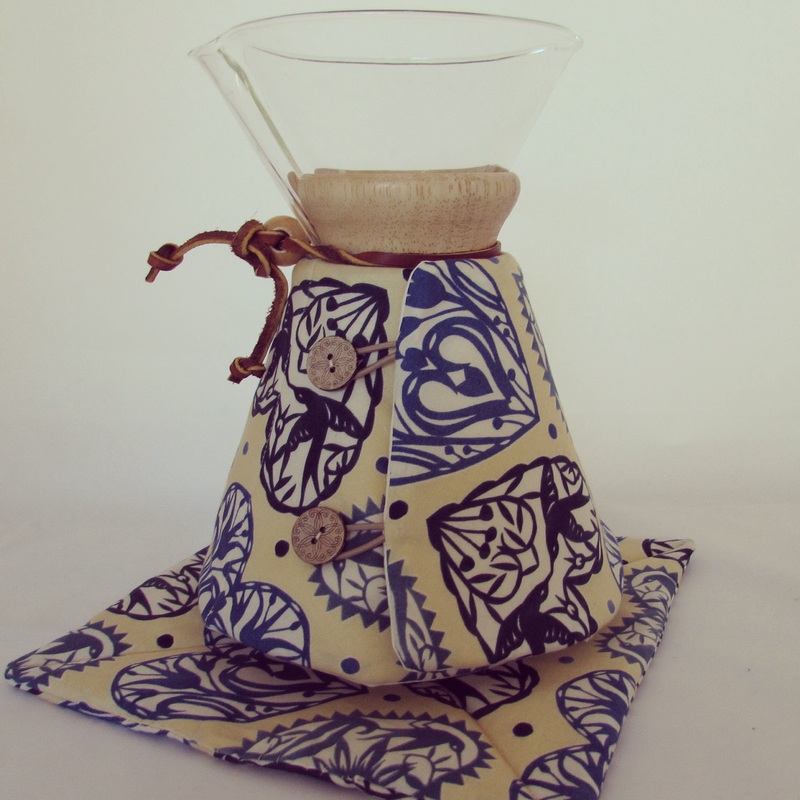 She sent me this beautiful fabric and asked me to make a Chemex cozy with it. I posted about that project here. 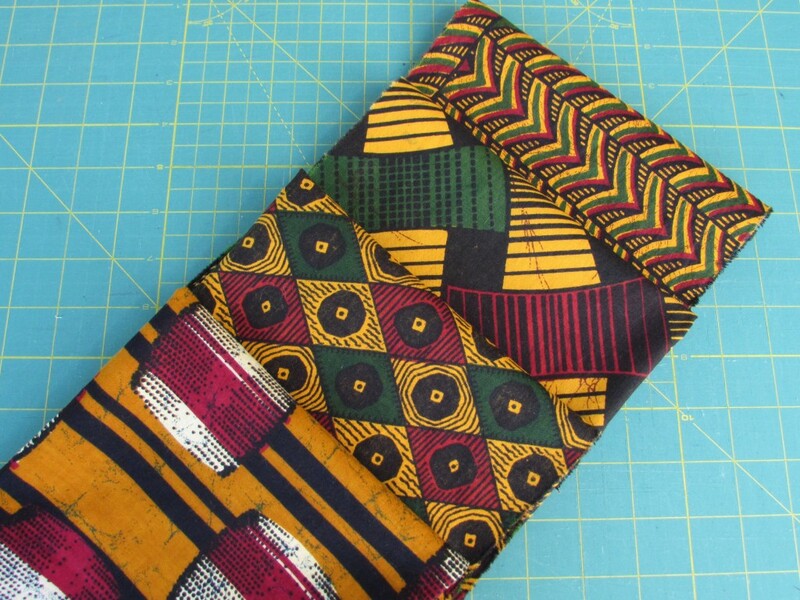 The fabric she sent me was Ankara, and it felt like a higher quality weave than these pieces. It was wonderful to sew with. I think I will use these pieces to create some items for my shop. These pieces are not large enough to make Chemex cozies so they will probably be used for French Press cozies instead. At any rate, I am so glad I took a minute to scan that bag one last time. Linking to Molly Sparkles Sunday Stash. 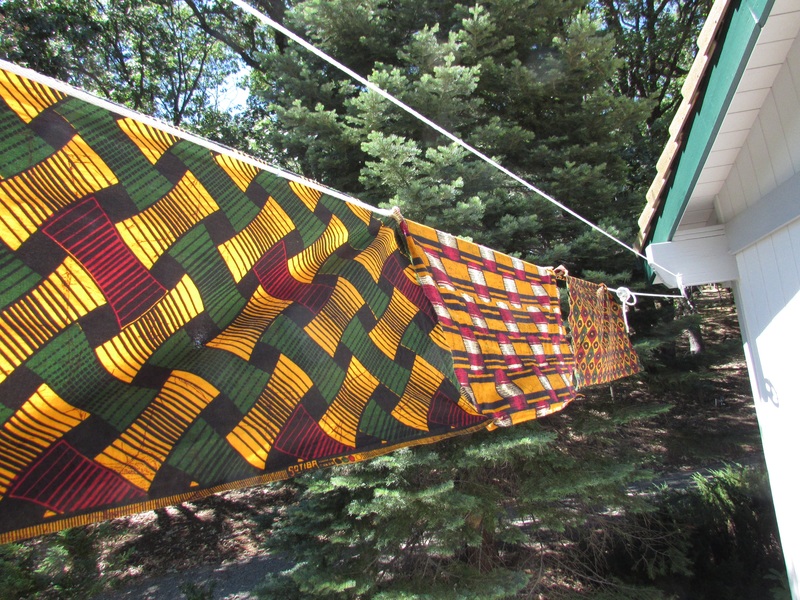 This entry was posted in Stash, Thrifting and tagged african wax prints, fabric stash, sotiba, thrifting on July 5, 2015 by Bernie. My Etsy stock was looking meager so this week I focused on making product to list. 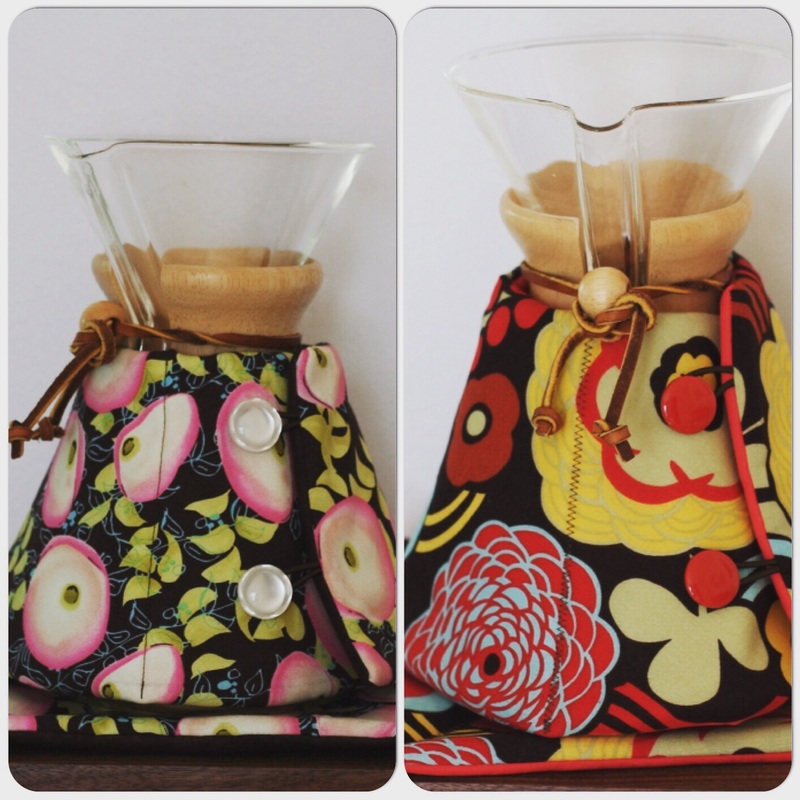 My biggest sellers are the Chemex cozies. 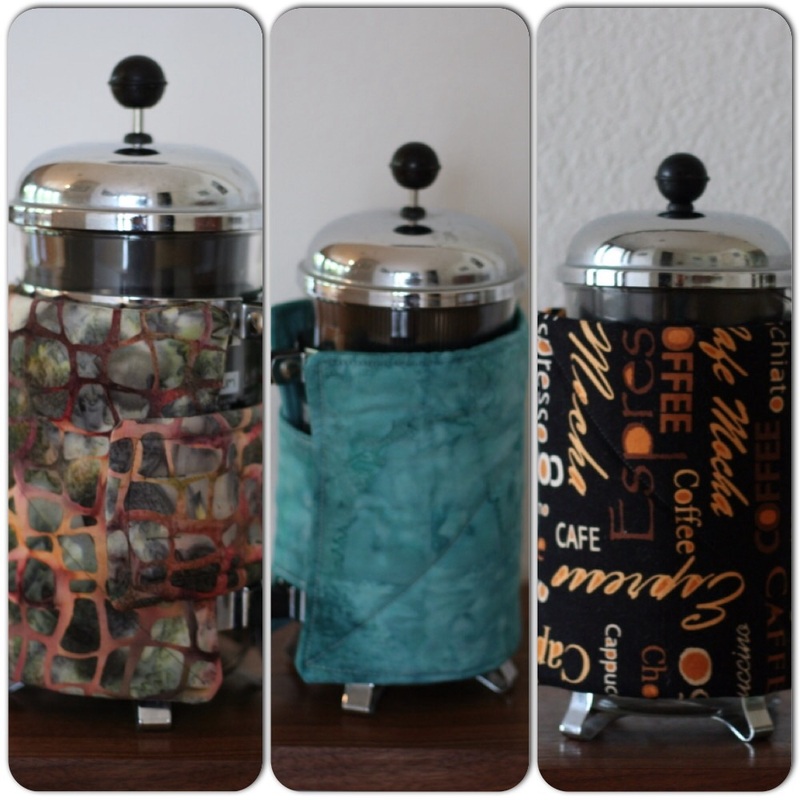 I have also recently sold a couple of French Press cozies. I took a look through my fabric, pulled a few pieces, and began cutting. It is amazing how quickly things go if I have a stack of pieces all cut and organized. One night of prep time pays off well. In all, I completed four Chemex cozies and three French Press cozies. Not too shabby. This is my favorite of the Chemex cozies. I received this piece of fabric from my boys as part of a birthday gift. (Read about this amazing present here.) I have a 1/2 yard cut of it and thought this would be a fun way to use some of it. Kind of makes that first pot of coffee in the morning a bit more powerful, right? Here are the others that I finished up. The French Press cozies are super easy to make. I cut out fabric for five of them but at this point, only three are finished. The blue one in the middle is gorgeous – the fabric reminds me of beach glass. All of these items are listed in my shop. Check them out here if you’d like. Being the beginning of July, it is time to make a plan for the month. 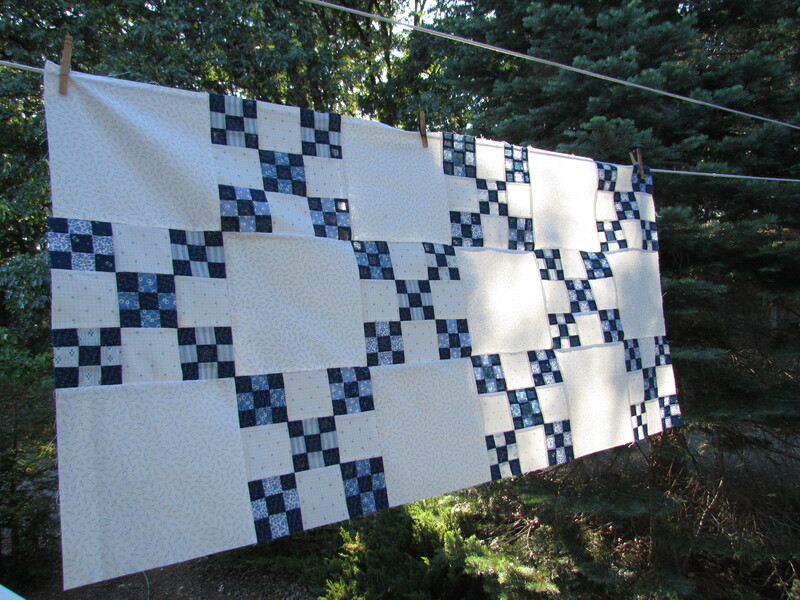 My main goal (and the one I will link to ALYOF with) is to complete my vintage double nine-patch quilt top. This is the one that I started working on last week. I haven’t made a whole lot of progress but I am hoping to get the quilt top done this month and then next month I can sandwich, quilt and bind it. I want to show it in a little quilt show in Downieville the first weekend of October and then it will be donated at an event two weeks later. This sounds doable to me but I better get going and finish up more of those baby nine-patch blocks. Hopefully I will also have time to finish the July row for my RSC15 project. I have been following Mari’s Classic Stitches BOM but I think for the month of July, I will veer off and use a different block. Hers looks fairly labor intensive and I don’t think I will get it done with the other project. If I choose a simpler block it will be more likely to get finished. Gotta know our limitations, right? Hope all of you in the US have a fun, safe holiday on the 4th of July and a happy weekend to everyone else! Linking to Sew Bittersweet Designs, Crazy Mom Quilts and TGIFF. Links are located at the top of the page under Link Ups. 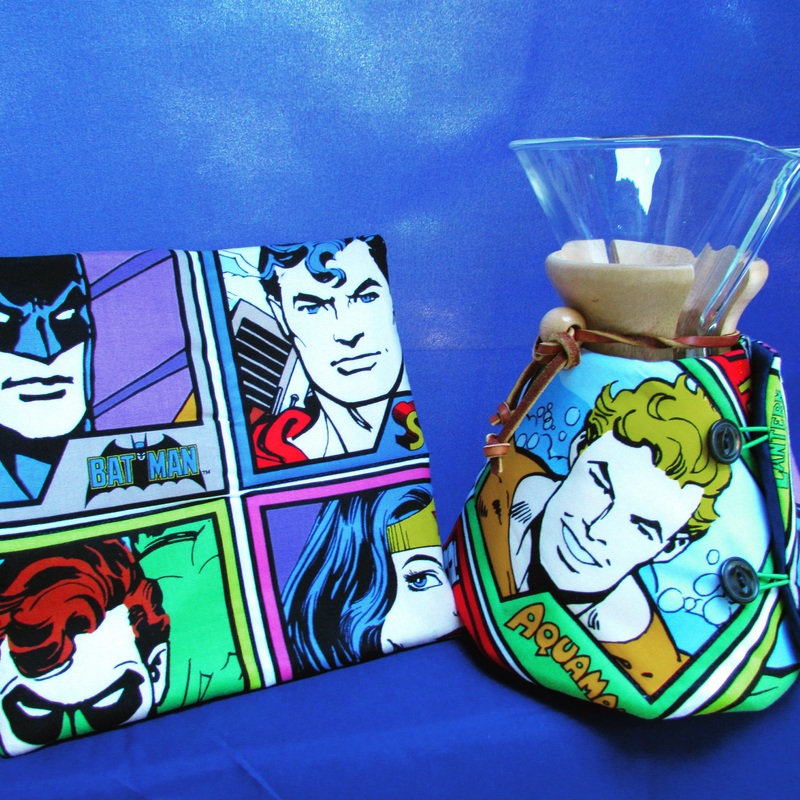 This entry was posted in ALYOF, Etsy and tagged chemex cozies, french press cozies, marvel comics fabric on July 3, 2015 by Bernie.